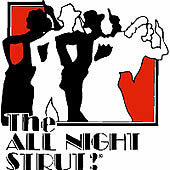 A classy, sassy musical celebration of the 1930s and '40s, The All Night Strut! struts its stuff in a two act bonanza of the way things were during the depression, World War II and the post war boom. From the funky jive of Harlem to the sophisticated elegance of El Morocco and the romance of the Stage Door Canteen, this is an evening filled with jazz, blues, bebop and classic songs. An international hit, The All Night Strut! has delighted audiences old and young with its sublime music and sheer energy. Famous songs include "Minnie The Moocher", "In The Mood", "Fascinating Rhythm", "Hit That jive, Jack" and "As Time Goes By".